Fakro manually vented skylights are a great way to brighten up almost any room in your home while providing the option of circulating fresh air. This ENERGY STAR deck mounted skylight features bracket-free, one-person installation suitable for roof pitches between 15 to 85 degrees. A perimeter seal lines the solid wooden frame providing a "warmer" roof boarding-skylight frame joint. Once in the rough opening screws (included) secure the skylight to the roof deck, followed by your trusted brand of water and ice shield (sold separately) and finished with Fakro step or high profile flashing (sold as a compatible accessory). The single chamber glass panes are filled with argon gas and feature a Low-E coating to help filter UV rays. A mosquito screen, a template for cutting the rough opening, and installation hardware are included. A crank (SZK) or extendable control rod (SZS) for opening and closing as well as other Fakro accessories are available. A premium deck mounted skylight that provides a natural finish. Includes a Canadian Douglas Fir curb, PVC base frame and extruded aluminum cap. IMPORTANT: Must be installed using Columbia's Deck Mount flashing kit or warranty is void. Available online (Model FKRW C06). The FAKRO FWU Side Hung Roof Access Window is available in right opening FWU-R or left opening FWU-L. The finished pinewood interior is pressure-treated and double coated with a water-based clear acrylic lacquer. The single chamber glass panes are filled with thermal regulating inert argon gas. The tempered glass filters UV rays with a low-emission coating. This ENERGY STAR deck mounted roof window features bracket-free, one-person installation that is suitable for roof pitches between 15 to 55 degrees. A perimeter seal lines the sturdy wooden frame providing a "warmer" roof boarding-window frame joint. Once in the rough opening, 4 to 6 screws (included) secure the window to the roof deck, followed by your trusted brand of water and ice shield (required and sold separately) and finished with Fakro step or high profile flashing (required and sold as a compatible accessory). 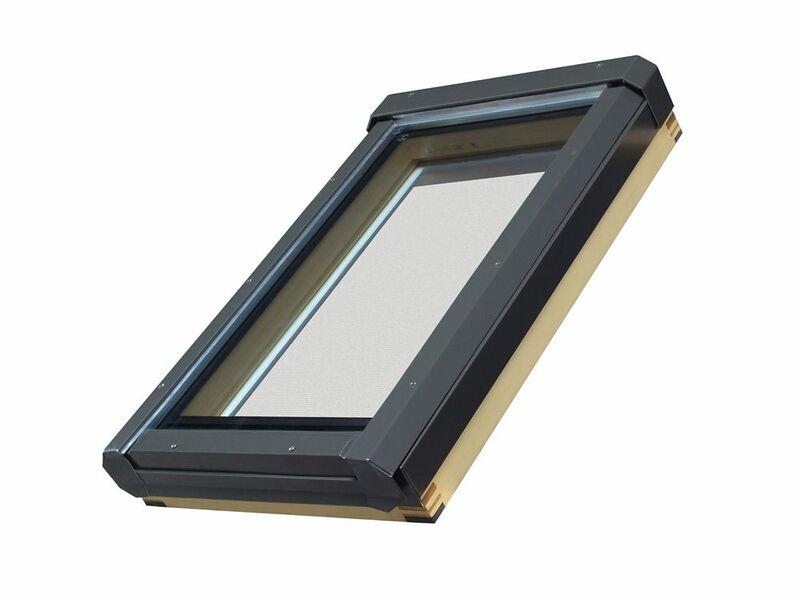 The FAKRO EHW High Profiled Flashing is a special flashing used only for FAKRO FWU Left or Right opening Roof Access windows of the same size. The FAKRO EHW High Profiled Flashing is for use with profiled roofing materials 10mm or more, such as high profiled metal sheeting and roof tiles. The FAKRO FWU Side Hung Roof Access Window is available in right opening FWU-R or left opening FWU-L. This size (24x46) can serve as a roof access or an emergency exit where an extra method of egress is required. The finished pinewood interior is pressure-treated and double coated with a water-based clear acrylic lacquer. The single chamber glass panes are filled with thermal regulating inert argon gas. The tempered glass filters UV rays with a low-emission coating. This ENERGY STAR deck mounted roof window features bracket-free, one-person installation that is suitable for roof pitches between 15 to 55 degrees. A perimeter seal lines the sturdy wooden frame providing a "warmer" roof boarding-window frame joint. Once in the rough opening, 4 to 6 screws (included) secure the window to the roof deck, followed by your trusted brand of water and ice shield (required and sold separately) and finished with Fakro step or high profile flashing (required and sold as a compatible accessory). 24-inch x 38-inch Fakro FV Manual Vented Skylight - ENERGY STAR® Fakro manually vented skylights are a great way to brighten up almost any room in your home while providing the option of circulating fresh air. This ENERGY STAR deck mounted skylight features bracket-free, one-person installation suitable for roof pitches between 15 to 85 degrees. A perimeter seal lines the solid wooden frame providing a "warmer" roof boarding-skylight frame joint. Once in the rough opening screws (included) secure the skylight to the roof deck, followed by your trusted brand of water and ice shield (sold separately) and finished with Fakro step or high profile flashing (sold as a compatible accessory). The single chamber glass panes are filled with argon gas and feature a Low-E coating to help filter UV rays. A mosquito screen, a template for cutting the rough opening, and installation hardware are included. A crank (SZK) or extendable control rod (SZS) for opening and closing as well as other Fakro accessories are available. 24-inch x 38-inch Fakro FV Manual Vented Skylight - ENERGY STAR® is rated 5.0 out of 5 by 2. Rated 5 out of 5 by Nick from Great skylightrs I bought these skylights a couple of months ago and installed them in am existing roof. Great instructions and templates to install. You are able to remove the window portion, install the very nice wood frame, and then clip the window back in, Very good quality and looks fantastic. Don't forget to buy the crank handle which is sold separately.